The bride getting ready is one of my favorite parts of the wedding. It is even better when you have an amazing location to photograph her at. Jennifer and Anthony had their wedding on August 20th, 2016 at the Tonawanda Castle in Tonawanda, NY. Jennifer got ready on the third floor. This room is great for the bride and her bridesmaids. There is such a light and airy feel to this room and always makes for great photos. 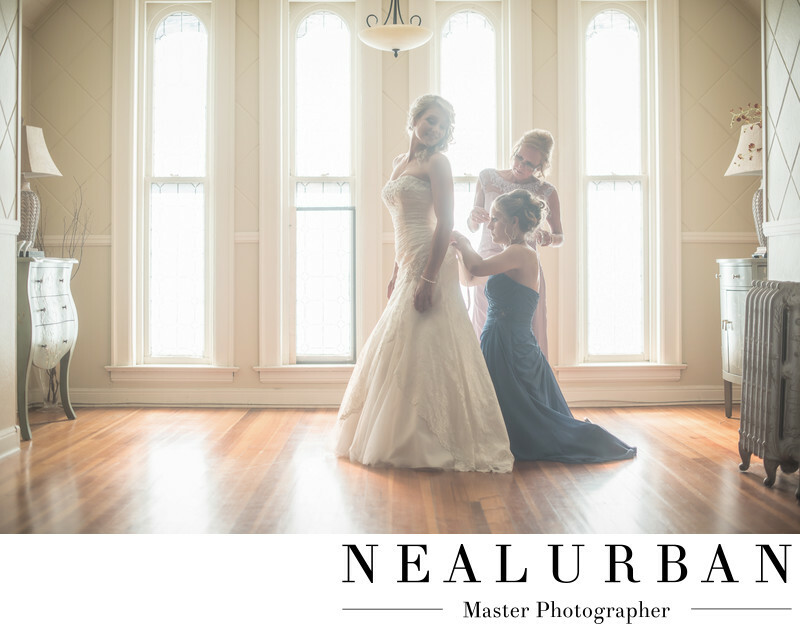 To help the bride into her dress, we always ask whoever is helping to be completely dressed and ready. We do not want them in street clothes. This is because we want to capture some amazing images. Could you image this image with the bridesmaid in sweats or jeans? It would ruin the whole image. Jennifer was put in the best light possible for this. The windows are so nice and backlight everyone in the image. Everyone is glowing! Jennifer's bridesmaid is finishing up the back of her dress. That always takes some time if it is a corset or those tiny buttons. But, it always makes a beautiful image. You can see here, mom is looking in on the dress and helping. We love to bring in mom and have her a part of the getting ready. We do this even if she is not the one doing the dressing. We will have her help in some way. This worked out great where mom was standing. Then having the bride look back toward them with that smile. Gorgeous! Neal moved out most of the furniture for this shot. He wanted bride to have as much room as possible. And this image would not look so great if there was a table in the back ground either. When we first arrive to see the bride, we always take a look around to see where the best place for her to get dressed. We look for the best lighting. Most of the time that means moving out some furniture. It's all to make the photos look amazing! Location: 69 Delaware St. Tonawanda, NY 14150.